The traditional ceramic restoration remains popular with many doctors because of its proven track record and can be used in conjunction with partials and implants. Available with your choice of alloy – non-precious, semi-precious, white and yellow high noble – our porcelain-fused-to metal restorations merge the strength of a cast substructure with the aesthetics of applied porcelain. Is a proprietary blend of palladium, platinum and gold offers ideal biocompatibility and improved strength when compared to traditional metal coping alloys. 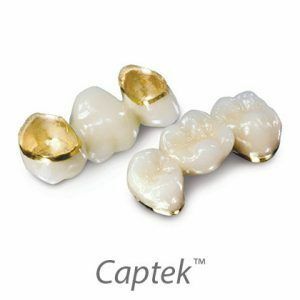 Because of its warm coloration, Captek™ substructures offer improved aesthetics for crowns, delivering more lifelike, esthetic shading. Full-cast metal is a restoration that provides a durable and true option for restorative dentistry. With high biocompatibility, no other restoration can deliver the dependable results of a full-cast restoration. This product is offered in non-precious, semi-precious, white high noble & full gold. The most esthetic full-contour zirconia on the market, our Dentsply Sirona Cercon® XT zirconia, is a remarkably durable restorative material, making it ideal for esthetic restorations. Crafted using the finest in CAD/CAM technology for the most precise fit available; Dentsply Sirona Cercon® XT crowns are gentle on opposing dentition and easily adjustable chairside. This new extra-translucent zirconia material that demonstrates extra high translucency in all 16 VITA* shades with True Color Technology. Thanks to its extra high translucency (approx. 49 percent translucency) and unparalleled shade accuracy allows life-like aesthetics especially for the anterior region (bending strength: 750 MPa) but also is a doctor’s fan favorite of posterior restorations! 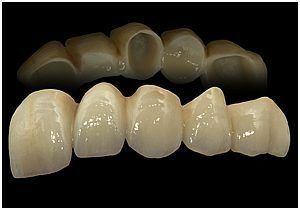 Crafted from a lithium-disilicate glass ceramic, IPS e.Max® crowns offer the utmost translucency available from any restorative material. Because of their superior aesthetics, e.Max® crowns are a perfect option for anterior restorations when aesthetic concerns are priority. e.Max® delivers the ultimate in metal free aesthetics and strength utilizing both Pressable and CAD/CAM technologies. IPS e.Max® provides outstanding aesthetics, high strength, and predictable shade matching even with difficult combination cases. Now, the laboratory can produce the highest quality aesthetic restorations using the most progressive fabrication methods with the industry’s most innovative material. For more information on IPS e.Max® Restorations, please visit the Ivoclar Vivadent website. IPS e.Max® Restorations is a registered trademark of Ivoclar Vivadent, Inc. but is offered through Dental Laboratory Group. 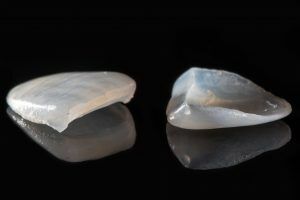 Zirconia substructure with layered porcelain (PFZ) provides warmer, more lifelike tones when compared to conventional PFM. 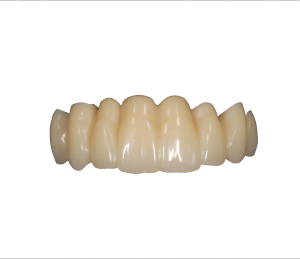 Our PFZ features the durability of a zirconia coping with the superior aesthetics of porcelain stacked by our master ceramists. With copings fabricated from CAD/CAM technology, our PFZ seats easily and with little to no chairside adjustment with an aesthetic end result. Zirconia has been a choice restoration for posterior crowns since the decline in the demand for alloy based restorations but KATANA™ Zirconia has enamel-like translucency with innovative multi-layered technology, making it suitable for full-contour zirconia crowns, including anterior restorations. 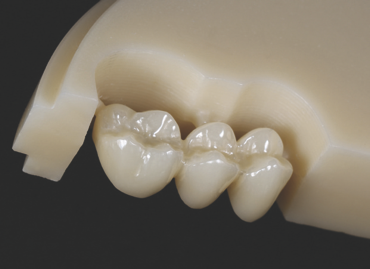 KATANA™ Zirconia has a comparable translucency to e.Max, as well as a higher mechanical strength. KATANA™ Zirconia UTML/STML is designed to achieve superior results with both gradational chroma and translucency for aesthetic restorations. KATANA™ aesthetic zirconia is manufactured by one of the top porcelain companies in the world, Noritake. What’s amazing about this aesthetic zirconia by KATANA™ is the highly aesthetic results it can produce. The Katana™ zirconia disc is multi-layered which helps achieve a natural tooth appearance. The diagnostic wax-up is often the most important tool for selling treatment, case presentation, and case planning. At the Dental Laboratory Group, we have a group of highly skilled technicians who are able to create detailed, fully functional diagnostic wax ups that you can use to assure function and esthetics for your case. The unrivaled communication that the diagnostic wax-up is able to provide dramatically increases case acceptance. In this technique, the dental lab removes the desired amount of tooth structure from the preoperative model and the restoration is waxed onto the patient’s prepped teeth. 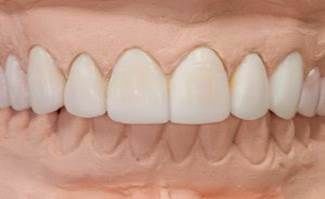 Along with a diagnostic wax-up it is also suggested to request a lab putty to place over the wax up to mimic the exact contour /shape of the teeth for temporaries to be fabricated. With our PMMA/wire re-enforced temporaries, you can provide your patients with a beautiful smile as soon as you prepare their teeth. Your patients no longer need to postpone treatment for fear their temporaries will look unnatural. Send us your impression and preoperative model, and we will do the rest. After preparation, you simply reline and cement the temporaries in the mouth. This provisional restoration is recommended by periodontists for patients who will undergo tissue therapy, and is ideally indicated for larger cases when you wish to obtain patient acceptance prior to prescribing the final restoration. In these cases, you can take an impression of the temporaries so that the laboratory can duplicate the dimensions and morphology in the final ceramic restoration. 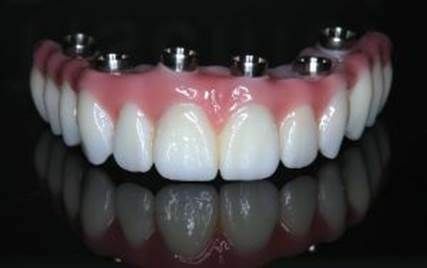 Our PMMA Provisionals offer durability and esthetics for a temporary restorative solution. This restoration is milled out of a dense block of PMMA, which provides the provisional with natural esthetics due to the material’s translucency. Available in 16 VITA® classical and bleached shades in both monocolor and multilayer options. Our custom implant abutments are available in titanium and zirconia both available as screw retained or cement retained to fit your patients’ individual needs. All of our custom implant abutments are precisely milled using CAD/CAM technology to facilitate a natural-looking emergence and optimize soft-tissue contours and crown esthetics. This precise interface also ensures comfortable delivery of the final restoration and excellent gingival health. Our implant abutments are compatible with most popular implant systems and are competitively priced. Our implant department is focused on creating superior implant attachments. Whether you need a single restoration or a full mouth case, consider implants as a viable and practical option. A “screwmentable” is a hybrid of a cement-retained crown with a screw access hole for retrievability and an abutment. 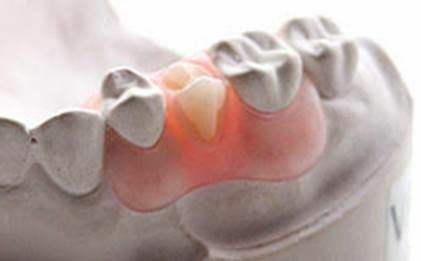 The crown is cemented to the abutment extra-orally, creating a single-piece restoration. Screwmentables are usually custom abutments due to angulation and exit of the abutment screw. 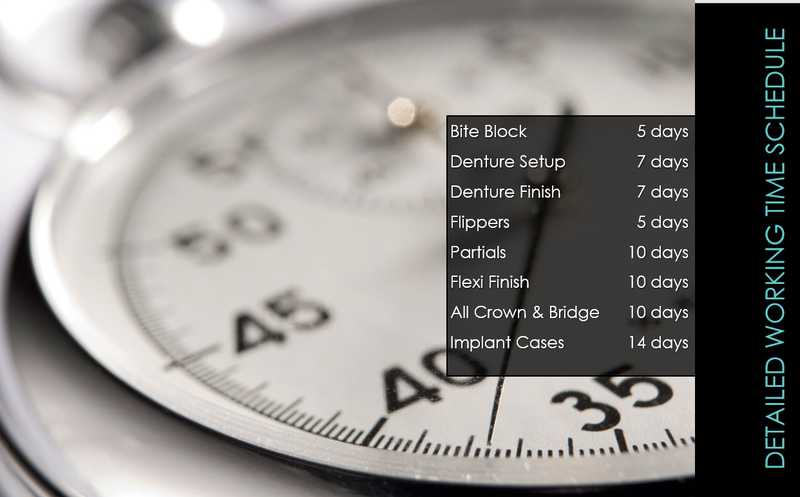 We work with several manufacturers in order to ensure you are using the best implant system for your specific case. Our technicians undergo substantial training and are up to date on the various implant systems and latest technology to maintain the quality restorations you would expect from the Dental Laboratory Group, the largest milling center in the northeast! Dental Laboratory Group can fabricate surgical stents to facilitate implant placement in respect to position and angulations. A successful implant restoration is dependent on proper position. Correct implant placement is more predictable when a surgical stent is used. 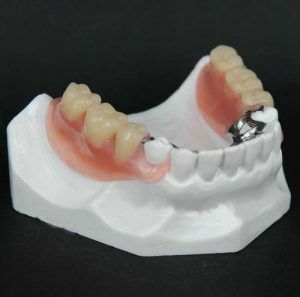 Flexible partials allow you to offer your patients a strong partial without metal clasps. This flexible resin system is stronger, more stain resistant, and less likely to fracture than similar systems in the past. 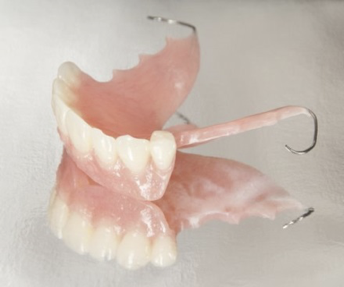 These flexible partials are processed using an injection system that insures great accuracy. Being a thermo-plastic material that has great adjustment characteristics, and can have clear clasping, it provides your patients with a strong, adjustable, and flexible partial. These removable partials are constructed almost entirely out of acrylic, and include wrought wire clasps to hold the prosthesis in place. They are designed for patients who have one or more missing teeth but are not fully edentulous, and are made by a press pack method with Lucitone 199 acrylic and Artic teeth by Kulzer. 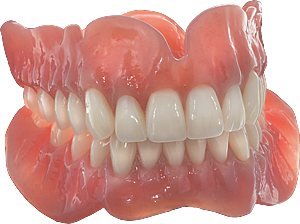 Full dentures incorporate the very best craftsmanship that our talented technicians have to offer. 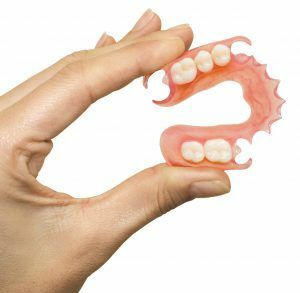 When maximum aesthetics are required, let us deliver a denture that has meticulous festooning and stippling, anatomical palate and muscle tone, and lifelike tissue toning. 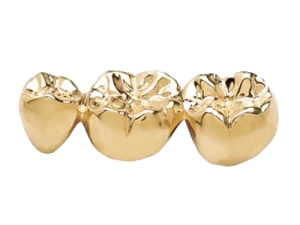 Premium teeth are available for higher aesthetics. 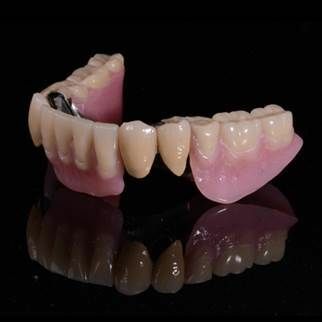 Industry standard, Lucitone 199 is the premium choice for both tissue and implant-supported full and partial dentures, offering outstanding aesthetics, high impact resistance and superb flexural strength. Excellent aesthetics are paired with balanced translucency and lifelike vein simulation. Shade choices are original, light, light reddish-pink and dark pink gum color. The future is digital, and this includes denture construction. At the Dental Laboratory Group we’ve been working hard over the past several years to develop our own method for designing and fabricating digital dentures using the most advanced software and materials. The result is an excellent fitting appliance with outstanding aesthetics, and a workflow that integrates with digital technology. This premium cobalt-chrome partial denture alloy maintains a high luster and will not tarnish or corrode. This alloy is also nickel- and beryllium-free, resulting in a biocompatible appliance for the patient. 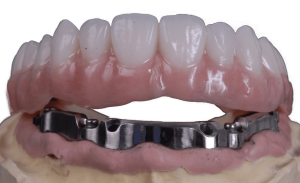 Metal partial framework can be designed in many different ways to create the most retention for a patient. Partial framework is made out of chrome cobalt for durability and is a sustainable material. 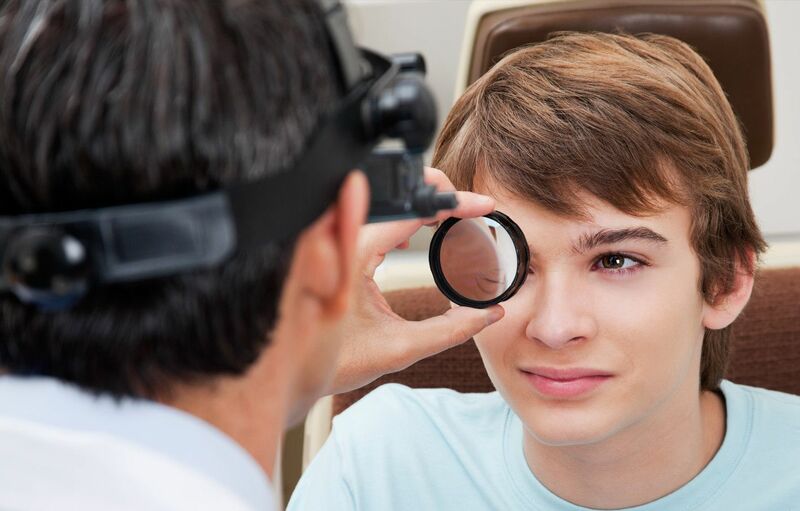 We design our frameworks to fit the specific needs of every patient. Your patients will be highly satisfied with its excellent fit, function, and longevity that is not found in competing restorative partials. 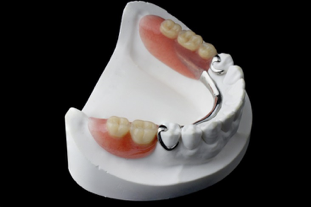 A precision attachment denture is a kind of partial framework that contains precision attachment(s) to lock the denture onto a fixed restoration. 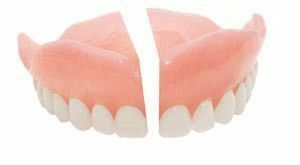 Precision attachment dentures are made up of two components. The ‘male’ part is fixed to the fixed and the corresponding ‘female’ section is incorporated into the partial denture interlocking them together. 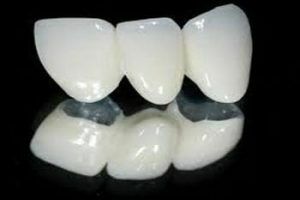 Hybrid partial frameworks are the same in material as metal partial frameworks but instead of metal clasping, they are fabricated with flexi clasps around anterior teeth. The flexi clasp is adhered to the metal partial framework to mimic gum shading. Shade choices are original, light, light reddish-pink and dark gum color. Clasping is also available in tooth colored clasps. Flexi nesbits and acrylic flippers are used for 1-3 teeth replacement and the shade choices are original, light, and dark meharry. Flexi nesbits are all flexi material and flexi clasping. Acrylic flippers are fabricated from acrylic resin & wrought wire clasps. 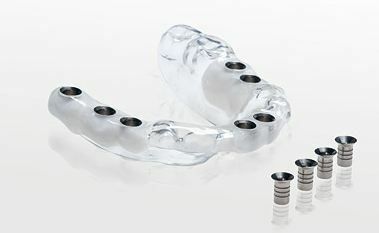 Flexi nesbits and acrylic flippers are used temporarily most of the time before implant placement. Add Wire Clasp – A wrought wire clasp used on a removable partial. Add Flexi Clasp – A clasp made of flexible material that easily creates retention for removable partials. Tooth Colored Clasp – Tooth colored material is used to generate this clasp for removable partials. ​​​​​​​Hard Reline & Soft Relines Provided. Metal Mesh Reinforcement available upon request! Fixed-Removable restorations are implant-retained. While they can be removed by the patient for hygiene, they feel fixed in the mouth to the patient. They can provide proper lip support. Types of attachments include locator abutments, bar, clip or ball type attachments. Each type of attachment provides varying levels of fixture. Bars are fabricated of titanium or cobalt-chrome using CAD/CAM methods, and connect to the implants with screws. Protocol for this restoration follows traditional denture protocol. For strength and durability, the restorations may have a metal framework incorporated in the denture. Bar shapes come in many different profiles. Pricing is determined by the number of implants and the type of bar profile. Please call to discuss treatment planning options for this type of restoration. Prettau Zircona is the material of choice for frequently occurring problems like reduced available space bruxism or ceramic chipping. If offers a functional and at the same time aesthetical solution. This highly biocompatible and no-porous material distinguishes itself through its extremely high translucency and perfectly natural appearance. Due to these characteristics and if used in conjunction with our special coloring technique, these aesthetic expectations can be met with the Prettau Zirconia All-on-4/6. Hybrid permanent restorations can also be milled from monolithic zirconia. Like the conventional Hybrid, it is secured to the implants with screws. 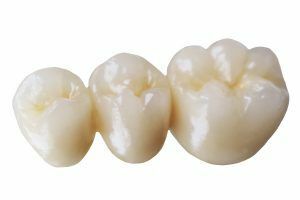 The All-Zirconia restoration offers increased durability by eliminating issues associated with veneered porcelain, acrylic teeth and acrylic bases. Full Zirconia Bridges can be as short as 3 units up to a full arch restoration. 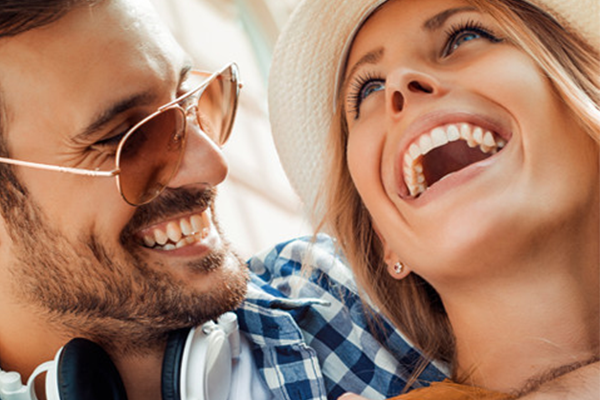 Having a beautiful smile may be even easier than you think. Many people achieve the look they’ve been dreaming of with our simple “bleaching” procedure. Bleaching stents are ideal to use in situations where a solution is needed to improve heavy staining. This popular procedure that is recognized as non-invasive way to improve esthetics can be done at home. A thin (0.035) vinyl material that is vacuum formed over either an upper or lower arch. A light cured block-out material is applied to the buccal surface of the model and acts as a reservoir for the fluoride or bleaching solution. 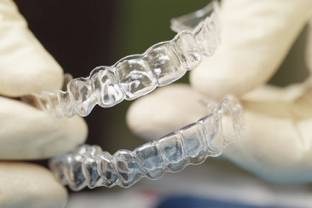 Custom bite splints and night guards that are made to your occlusal plane specifications on upper or lower models are very important to those who suffer from heavy bruxism. Thanks to research and developments night guards can be solution to those migraines and headaches. Many don’t realize that grinding and clenching the jaw can attribute to jaw pain and headaches. There are a couple options for night guards that can protect and help maintain teeth healthy. Thermoformed soft, hard or semi-hard materials are used for the fabrication of night guards. Night guards are designed for moderate to severe teeth grinding / bruxism. Made of a hard acrylic outside for durability with soft inside for comfort is the most popular choice. Dental Laboratory Group is always on the cutting edge of leading technology offering its doctors convenience and cost-effective options. We are certified in the latest digital technology and can receive digital impressions and fabricate any type of dental restoration. With digital impressions, you can accurately capture each and every preparation to get precise and accurate results every time. This means less costly remakes and less chair time for re-insertion. More comfort! No more impression material, trays, or setting times to worry about. Save time and shipping costs: send your digital impression file to our lab instantly so we can start on your patient’s restoration. On the touch screen monitor for accuracy as well as being able to discuss treatment options side-by-side with your patient. This means you can instantly capture impressions and review them on the touch screen monitor.